Imagine a tall figure in a black suit. His face, if there is one, hidden in the shadows, a glimpse of pale, unnatural skin. He has impossibly long arms that reach out like slim tendrils grasping at those who get too close. Strangely, it seems that there are more than just two arms and, octopus like; they move constantly making it difficult to even be sure what you’re seeing. This figure has been seen in school yards, outside of homes and at sites where disasters have occurred. He is a nightmare figure, haunting the dreams of many and blamed for the disappearance of both children and adults through the ages. He is the Slenderman. But is he real or a complete work of fiction? By most accounts, it seems that the Slenderman was born from something awful, that is, the Something Awful website and forums. In 2009, members of the forum were called to participate in a contest. The challenge was to create a fake photograph that depicted something paranormal in nature. There was more however. Once the fake photo was created, it had to be promoted on the Internet as the genuine article. Those with an interest in the paranormal had to be convinced that the subject of the photo-shopped image was real. The results seem to be far beyond what the originators imagined. In a brief time, the Slenderman meme rapidly traveled to all corners of the Internet. A video series was posted, an ARG (Alternate Reality Game) was created and countless blogs appeared to discuss this weird being. Tales were passed via twitter, facebook, email and discussion boards. The Slenderman it seemed was gaining momentum. Once the contest was opened, a barrage of photoshopped pictures and creepy stories followed. Haunted objects and weird creatures were in abundance but nothing lit the community on fire like the images posted on June 10th. Answering the paranormal oriented challenge was forum member ‘Victor Surge’. Surge’s photos were fairly simplistic and that seemed to be part of their power. By choosing a subtle route, Surge created a mystery that was open to interpretation but contained a disturbing, underlying tone. The initial photos, and their brief descriptions, placed the “Slender Man” in the mid nineteen eighties. The scant information included allowed those reading to leap to numerous conclusions and imaginations ran wild. One photo is credited as ‘photographer unknown, presumed dead’. 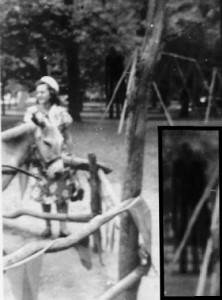 It shows a group of people that appear to be running from a strange, tall figure that lurks in the background. “One of two recovered photographs from the Stirling City Library blaze. Notable for being taken the day which fourteen children vanished and for what is referred to as “The Slender Man. Deformities cited as film defects by officials. Fire at library occurred one week later. Actual photograph confiscated as evidence. This description appears to be the first use of the name “Slender Man” to define the mysterious being. The name quickly morphed into the now common “Slenderman”. The next day, June 11th, Surge added a document which he claimed was a police report from 1955. The report was covered with scribbled notes and what was purported to be blood stains. Among the notes was the statement: “Slenderman, Slenderman, kill us already, kill us, kill, kill, kill”. Victor Surge continued to add material to the thread. Drawings done by children, clippings from newspapers, more photographs with a thin, barely discernible figure hiding behind trees and statements from those who had encountered the Slenderman. At this point, there was still little known about the dreaded being. It was implied that he was responsible for disappearances, the loss of life and perhaps disasters. It was clear that he was something otherworldly and that he invoked terror in those he stalked. The Slenderman quickly moved beyond its initial inception by Victor Surge. Others began to add to the mythos and the figure blended with various bogeymen of the past, growing and morphing into an even more disturbing creation. Within a week, the Slenderman’s history expanded greatly. Aside from countless modern tales, there were now stories that placed him in the Middle Ages, and, even further, back to Lower Egypt circa 3100 BC. It seemed there was no stopping the development of this legend and it was about to take another leap forward. The next significant phase in the development of the Slenderman came in the form of video. The first of many was a series called “Marble Hornets”. The unfolding tale of Marble Hornets is narrated by “Jay”, a friend of the film’s producer. Marble Hornets was purported to be a student film that detailed the story of a twenty something’s return to his childhood home. The project took place over two months with periodic scenes being shot and directed by Alex the man behind the film. Most of the film took place outside, close to the director’s home in a wooded area, in an attempt to replicate a rural small town. After two months, Alex suddenly ended the project without explanation. His only comment was that he found “unworkable conditions” at the shooting location. Jay found the situation odd. Soon after he received the news from Alex, he noticed that the director became distant and began to avoid everyone, choosing to sit alone in his house. Jay claimed that he put the whole incident out of his mind and that the tapes remained unwatched for a period of time. Eventually, he began going through the footage and posting clips from the tapes. Marble Hornets is essentially a part of the genre of ‘found footage’ made popular by films such as The Blair Witch Project and Paranormal Activity. Has the video clips are revealed, viewers learn that Alex was being stalked by a being he calls “The Operator” aka the Slenderman. Once Jay begins posting the video clips on the Internet, Alex disappears. Jay then beings to document his search for Alex and his attempts to uncover the mystery of the Operator/Slenderman. As of early 2013, the Marble Hornets website is still active and posting continue. Because of the interactive nature of Marble Hornets, it’s considered an ARG (alternate reality game). In this format, people are free to post their responses and their own videos to contribute to the story. The lines between fact and fiction are blurred in this format by the addition of news items and current and past events that are tied into the overall story. Marble Hornets reveals that the presence of the Slenderman has an effect on audio and visual recording equipment. Strange noises and interference show up on tracks recorded when he is near. Visual images are distorted and sometimes only static or strange shapes are captured. In the course of the series, we also learn that he has an affinity with doorways and that he may control where they lead. He emerges from rooms shown to be empty and he lures people to doorways that lead to strange locations other then the rooms that should be there. We also learn other things about the Slenderman throughout the series. His effect on the people who encounter him is far reaching. They experience physical pains, coughing fits and other strange episodes. They black out and lose time; performing actions they later have no recall of. Slowly, they slip into the depths of madness. 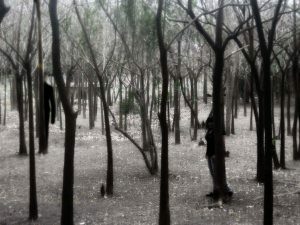 The material added in the Marble Hornets video represent another defining piece of the Slenderman mythos and set the course for the continued growth of the tales. On November 6th, 2009, the popular radio talk show Coast to Coast AM with George Noory received a series of phone calls from people expressing their concern about a creature that terrified them. Some of the callers reported seeing a tall, thin entity without a face. It was the Slenderman. Most disturbing, while some callers claimed that this being was plaguing their nightmares, others claimed that they had seen him in the physical, waking world. It would be easy to dismiss such accounts and believe that the callers were mistaken, delusional or even fabricating the stories but this was not the first time people have professed that the nightmare creature was a flesh and blood being. If we are to believe these accounts, it seems as though the Slenderman has leapt from the virtual pages of Internet blogs and stepped into the real world. Is such a thing possible? According to some ancient traditions, yes, it is. The statement’s implication brings to mind the Tibetan concept of the tulpa. There’s no exact translation into English for this term but the most common understanding is “thoughtform”. The tulpa legend is connected to Tibetan Buddhism and mystic traditions. In simplest terms, the creation of a tulpa, according to eastern teachings, is a process to bring a thought into physical existence. Through will power, the strength of the mind and focus the tulpa is created. Tibetan teachers believe that by following a specific set of meditations and rituals, a concentrated thought can become physical. This mental projection moves from the mind’s eye to the physical world. First, in the form of a shadowy, ghost like figure, eventually, as mental energy continues to be feed into the tulpa, it takes on full physical, life. Once created, the tulpa can eventually detach from its creator and proceed to live its own life, unconstrained by the originator’s initial thoughts. At this point, the tulpa seeks energy from other sources to continue its existence. On the surface, it does not appear that this process was carried out during the creation of the Slenderman. Certainly there’s no indication that anyone performed a process to specifically create this being. However, there are other possibilities to consider in terms of the tulpa/Slenderman connection. Is it possible, that it enough people believe in something, that this belief alone can give it life? What are the consequences of a mass number of minds focused on a singular concept such as the Slenderman? Despite the fact that the Slenderman can be traced back to his Internet origins and his fabrication during a forum challenge, the legend spread at an amazing pace and he quickly became an Internet meme. Slenderman spread like a virus and everyone involved had some influence, adding energy to the creation. The concept itself is driven by fear and paranoia, powerful, base emotions that generate high levels of energy. The human mind, hearing Slenderman stories, often runs away with itself. It’s easy to imagine tall figures lurking in the trees, just out of sight. The psychic energy of so many people focused on such emotions might well produce, even briefly, a physical manifestation. Such a creation could also play into suppressed memories or emotional traumas of the past. The human mind doesn’t like blank spots and will attempt to “fill in the blanks” even with something strange or unsettling. I’ve received countless communications from people who firmly believe they have encountered the Slenderman at some point in their lives. Many of these stories predate the Internet creation point by years. Taken by itself, Matt’s childhood recall could be dismissed as dreams or incomplete memories of a difficult period in his life. Matt’s story doesn’t end there however, because he saw the same figure as an adult. 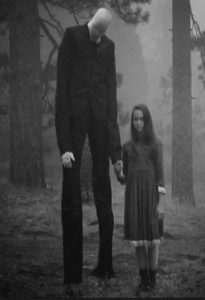 Some versions of the Slenderman legend say that once you see him as a child, he will follow you until you die, always there in the background, waiting. In conveying his story to me, Matt never called the being Slenderman. In fact, he told me that he was never sure what to call it, simply that it was a disturbing being and that he wanted no part of it. Matt gave me his account in 2004, well before the Slenderman mythos began in 2009. His is not the only such story that I have received. Take this account for instance. It came from a woman named Janet who recounts some of her experiences with a figure that has lurked in the shadows of her life since childhood. “I grew up in a rural area of Virginia. We lived in an old house and it had a lot of trees around it. There was a little clear space in the back yard but it went right up to some thick woods that were behind the house. My sisters and I mostly played in the front yard because it was bigger and had more grassy areas. When I was about ten I started waking up at night. It happened night after night. I would wake up at about two in the morning. Usually I would just lay there and try to get back to sleep, not wanting to get in trouble for being up so late. One night when I was laying there, I heard sounds outside. Since it was summer, my bedroom window was open and it had a screen in it to let the air in. My room was on the second floor and it looked out over the back yard. The sound was a scratching noise and I thought maybe one of our cats had got stuck outside. I went and looked out of my window to try to see what the sound was coming from. I looked down and to the right. I could see the back door from my window because it jutted out a bit. The moon was bright enough to give some light but I couldn’t see any cat there. I stood there looking around the yard. The scratching noise had stopped and the wind had picked up a little bit. Then I noticed something moving at the back of the yard, right where the woods started. It was too dark to really tell what it was but it seemed to be something very tall by the trees. I watched it move and knew it wasn’t a tree because it was walking along the line of the woods. Then it just stopped and I had the most awful feeling that whatever it was, it was staring at me. I felt really, really afraid and I ran to my bed, ducking under the covers and staying there until morning. By the next day, I had convinced myself that it had all been a bad dream. I continued to wake up at night for a while, but I didn’t get up again to look out of the window, just in case. A couple of years passed and the next incident that I clearly remember happened when I was almost thirteen. We were still living in the same house and I was still in the same bedroom. I hadn’t really thought about the earlier incident, I guess at that age there were plenty of things to occupy my mind. Suddenly though, I started having trouble sleeping. Like before, I started waking up late in the night between one and three am. I would lay there and try to fall back asleep which sometimes took a while. It was on one of those nights that I was laying there when I heard what sounded like a laugh. It was distant and I could tell that it was coming from outside in the yard. The sound was drifting up through my window. I got out of bed right away to see where it was coming from. Standing there looking out of the window, I remembered what I had seen when I was ten. It all came back to me in a rush at the same time that I noticed movement at the back of the yard, by the tree line. The fear came back too. This has continued through my life. Every few years I fall back into the pattern of not being able to sleep in the middle of the night. Always between the times of one and three am. I start waking up and have trouble getting back to sleep for a few hours. No matter where I’ve lived, even in different states, the pattern starts and I start waking up and I catch glimpses of this thing, whatever it is, outside of my window. For a while, I lived in a large city in an apartment building. When I started waking up while living there, I thought, no way will that thing be here in the city but it was. Still there, lurking outside of my bedroom, always watching. Over the years, I’ve seen glimpses of him, or it. It’s a very, very tall man and his arms are impossibly long. I’ve never seen a face, just glimpses of his head which I can tell is bald. I’ve always felt as if it’s just waiting for me to come outside, to see it closer and find out what it is. I think that’s what it wants but I don’t think I would ever come back if I went out there. Janet is not alone in having recurring visits from a shadowy figure. Randall contacted me about his sightings of a strange man that he saw on several occasions growing up. “I started seeing him when I was in my early teens. I think I was about fourteen the first time he appeared, at least, that’s the first time I remember seeing him. At first, he was outside around the trees in the yard. I first noticed him one evening when my brother and I were outside tossing a football back and forth. My brother missed a catch because I threw it high. The ball landed near the tress behind him and I stood there and watched as he went to get it. He picked the ball up and turned back towards me, that’s when I saw a weird figure in the trees behind him. It must have been seven feet tall and it had very long arms. I just stared at it because I couldn’t believe what I was seeing. I couldn’t take my eyes off it. It was moving very slowly sideways and I could see the long arms kind of swinging around. My brother threw the football and it just went past me I guess. He was calling to me but I didn’t hear him, it was as though I was entranced. He finally came over and gave me a shove on the shoulder telling me to snap out of it. I guess jarring me was enough because I looked at him, asked him if he had seen ‘it’ and pointed to the trees. He turned and looked at the trees saying ‘what? There’s nothing there’. After that we went inside but I couldn’t shake the feeling that there was something out there watching me, or maybe us. For the next few days, I kept catching glimpses of it around the outside of the house. My brother kept asking what was wrong with me because I didn’t want to be outside anymore. At some point, the thing just went away or I stopped seeing it, I’m not sure which. Either way, I forgot about it for a time. The next year my brother and I went to a summer camp. The first few days there were great, we made lots of friends and there was plenty to do. Then one evening, just as it was getting dark I saw it again. It was lurking in the trees and it was closer this time so I got a better look at it. The figure looked like a man at least seven or eight feet tall. His arms were long, they seemed too long, it wasn’t natural how far out he could reach with them. He was wearing a black suit and his face was very pale. I couldn’t see any of his features enough to describe him. I ran back to the cabin as quick as I could, I just wanted to get away from him. Other investigators of strange phenomena have received accounts of Slenderman and associated beings. Pastor Robin Swope is the author of the excellent book, “Slenderman From Fiction to Fact”. Swope chronicles the rise of Slenderman from its inception on the Internet through its development and growth. He also includes numerous related accounts that he has collected in his years of paranormal research. Swope breaks this section of his book down into three parts; General Encounters, Specific Encounters and Alien Encounters. General Encounters involve accounts describing entities that loosely fit the Slenderman mythos. The section on Specific Encounters details accounts that fit perfectly into typical Slenderman tales. The final portion involves Alien Encounters and their similarities to the Slenderman. Like myself, and other investigators, Pastor Swope has files of accounts that he received well before the Internet creation that bear a striking resemblance to the Slenderman. “…one is left with two simple options. The witnesses are either lying or telling the truth” says Swope. Indeed, much of the study of the paranormal comes down to the facts presented by the witnesses and their recall of events. People who outright lie about their paranormal encounters are not as prevalent as skeptics would like us to believe. When looking at reports of such phenomena, there are a portion of cases that can be explained by mistaken identity. Pareidolia is also a consideration. This is a psychological phenomenon that involves perceiving something significant within images or sounds. An example of this is seeing the shapes of clouds as animals or other objects. Swope had a brush with “something” himself when he began to delve into the phenomena. Although he does not claim that it was the Slenderman, he does question the power of such concentrated, negative energy. In his book, he examines the Slenderman from many angles, but leaves the possibilities open as to exactly what the phenomena is, calling us to question both the reality and the fiction of this weird creature. Despite a brief history, the Slenderman has found his way into many corners of the mainstream. He appeared in a music video for the song “Equinox” by Skrillex. He is the focus of a video game called Slender and appears to be the inspiration for the “Enderman” in the game Minecraft. 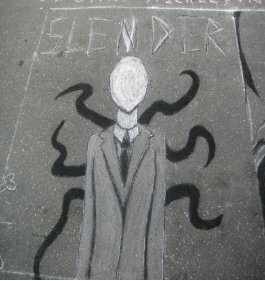 Slenderman’s influence can also be seen in movies and television either has himself, or in a thinly veiled guise. He may have been an inspiration, at least on some level, for a 2012 movie titled “The Tall Man” that deals with the disappearance of children in a small town. On the other hand, Slenderman’s image was likely influenced by entertainment such as the popular TV series Buffy the Vampire Slayer. One of the series’ most remembered episodes featured demons known as “the gentlemen” garbed in dark suits and having pale skin and bald heads. They moved in an eerie fashion and created silence around them as they carried out their dark deeds. The Slenderman holds a unique place in paranormal lore. Clear fictional roots are obvious yet countless people now believe that this being is a genuine phenomenon. Co-created, it seems, via a combination of elements made possible in modern times with the advent of the Internet, a gateway to new levels of mass consciousness. We have to consider these possibilities carefully as communication and connection continues to evolve. Moving forward, it seems the Slenderman will continue to play a role in the world of the paranormal and pop culture. Variety magazine recently reported that the rights for a big screen adaptation of the Marble Hornets series had been opted by Mosiac Media Group. A Slenderman movie would certainly solidify this disturbing figure in the minds of the masses. Successful viral Internet game, “Slender: The Eight Pages” is launching a sequel titled “Slender: The Arrival” due out in late 2013. Perhaps the Slenderman is merely a modern myth still in the making, a boogeyman for the 2000’s that will scare children and give adults a slight pause when unexplained noises are heard from dark corners. If so, then he will continue to show up on both the small and big screens of entertainment and, over time, he will evoke nervous laughter and chills on movie night. There is a darker possibility though. It may be that the collective consciousness of numerous people, spread far and wide, have co-created something quite disturbing. A modern tulpa feeding off the fear and dread created in the stories and legends being written about him. If this is the case, then there is indeed cause for concern for the only boundaries to his power lie in the minds of those giving him life. David Weatherly is a paranormal investigator, author and world explorer. For over 35 years he has pursued the world of the strange, investigating cases around the country and abroad. He has written and lectured on a diverse range of topics including Cryptozoology, Ancient Mysteries, Ufology, Hauntings, Shamanism and psychic phenomena. At a young age, David became fascinated with ancient mysteries and the paranormal. Early influences such as John Keel, Hans Holzer and Eric Von Daniken set him on course to spend his life exploring the unexplained. David has also studied Shamanic and magical traditions with elders from numerous cultures including Europe, Tibet, Native America and Africa. He has studied a range of energy systems from Shamanic techniques to Hawaiian Huna and QiGong healing. He has studied with Taoist masters in China, had an audience with the Dali Lama and is a Reiki master. David is also an accomplished martial artist and has taught Ninjutsu and Filipino martial arts. David has been a featured speaker at various conferences including the Paradigm Symposium, Sacramento Paranormal Summit and the Alamo UFO Conference. He has lectured for the Association for Research and Enlightenment, Carolina Shamanic Institute and various Paranormal and spiritual groups around the country. He has been a guest on a wide range of television and radio programs including: Ancient Aliens, Coast to Coast AM, Dreamland with Whitley Strieber, Veritas, Darkness Radio and Project White Paper. The post The Tendrils of the Slenderman appeared first on Paranoia Magazine.